We have had quite a few family celebrations over the past few years and more and more are centred around a special family birthday. As the family grows we see more and more varying age groups wanting to spend time together to celebrate. From tiny tots through to grandparents and even great grandparents (and even a great great nan in our family!). Finding a holiday that suits all ages can be tricky, moreover, keeping the younger ones entertained can often be a challenge in houses without facilities for toddlers and babies. All of the houses in this collection can cater for the tots looking to travel with you without compromising on the facilities for the adults. A beautiful family friendly villa in a quiet location. The old farmhouse has fabulous grounds and swimming pool. Various terraces and a wooded dining area are perfect for those al fresco meals - a lovely entertaining space. An impressive 200 year old manor with huge rooms and a terrace overloooking the valley. With its private swimming pool, its perfect for groups or large families. This fabulous house sits on the water?s edge offering magnificent views along the beach on this private luxury island less than two hours from central London. A peaceful child-friendly retreat set in 3 and a half acres of ground near Carcassonne, South of France qwith stunning views. 1 of 4 gites in a beautiful location, perfect for 2 families holidaying together with the sandy beaches of the Atlantic Coast only 20 minutes away. This amazing luxury holiday home is perfect for a special family celebration. With 10 bedrooms it can sleep up to 20 guests plus babies. It is located on the rural Osea Island just off the Essex coast. The island is only accessible by car a few hours a day and offers a remote escape for large family groups. There are no shops or restaurants on the island but this is why it is so idyllic for a real get away from it all type family holiday or celebration. The house has a private salt water pool and there is a shared outdoor swimming pool on the island. This beautiful baby-friendly holiday villa in Tuscany is perfect for a stress-free holiday with baby. Choose from one of the arranged and all-inclusive (including babysitting) yoga/cooking weekend or rent the whole villa out with friends or family. The villa boasts stunning lake and hill views, swimming pool and more. With a heated and fully enclosed pool and enclosed garden, this is a fantastic child friendly property for large families or 2 families holidaying together, and only 20 minutes from the sandy beaches! 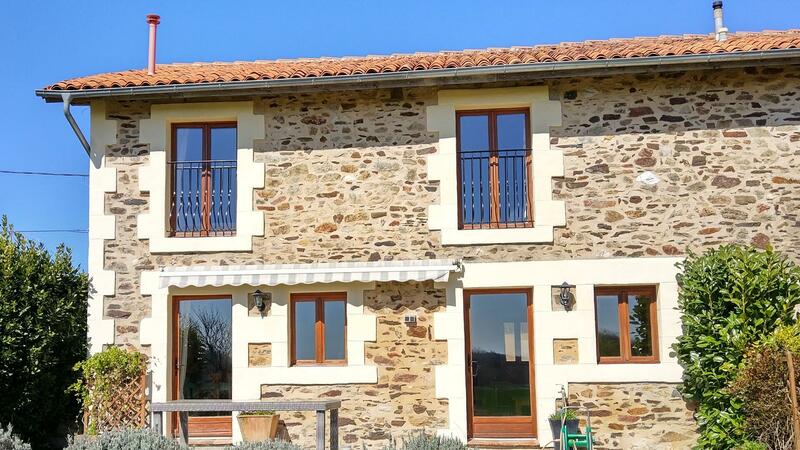 This super 7-bedroom holiday home in Lot et Garonne south west France is perfect for a multigenerational family holiday. There is a small cottage where one of the bedrooms is located, ideal for grandparents and five bathrooms. The gardens are big enough to offer a little space and quiet corners easy to find for a little afternoon siesta, this child-friendly holiday home is perfect for two or three families sharing and families with twins as there are four cots and highchairs. The swimming pool is fully enclosed and heated and there is a brilliant outdoor entertaining space, perfect for a special celebration. The Isle of Wight brings back fond childhood holiday memories for me, jumping on a boat as a child felt like were really going on an adventure holiday far away from home. This lovely country house is fabulous for families and or friends looking for a touch of luxury for their next child friendly holiday, and the Isle of Wight is home to wonderful beaches, theme park, zoo, stunning countryside and more. There are holiday apartments of varying sizes so ideal for a family or 3 or larger party of up to 22. Set in 7 acres of grounds, 1 of 3 gites with fully enclosed swimming pool and children's play equipment. A large child-friendly villa nestled amongst the Bordeaux vinyeards. Perfect for large families and big groups with a private heated swimming pool and spa room. This child-friendly cottage complex has something for everyone. There are seven cottages ranging from a two bedroom cottage with private garden, three and four bedroom cottages right through to a large six bedroom farm house. There is plenty for kids and adults alike too, with salt water heated pool, ponies, adventure forest and more plus beautiful Brittany beaches just 20 minutes by car.